A magnificent trip through a magical land. So, you must visit Machu Picchu. A destination, considered one of the 7 modern wonders of the world that will leave you breathless from the moment you first step on its mountains. It is one of the main tourist attractions in Peru. If you are considering to visit this place, it is likely that you have considered the Inca Trail to start your adventure. However, due to the restrictions and limitations imposed by the National Institute of Culture of the country to travel through this space, the road Salkantay (or Salkantay trek) has now become the best option. This is a different route, known as the alternate path to the Inka Trail. Best of all, besides having the same scenery and beauty, it is less crowded than the original Inca Trail, which makes it much more attractive. The snow-capped Salkantay is one of the highest mountains in the Cusco region. It rises to 6,264 meters above sea level. Exploring the Salkantay Trail is a unique experience that will become one of the greatest adventures of your life. Actually, according to Unesco, this walk is considered one of the best to enjoy in South America. You will feel a strong connection with nature from the very beginning, since the Salkantay Trail offers a very diverse and rich journey where you can fully enjoy the geography of this Andean country. Besides, it is an adventure of interesting yet contrasting experiences, with the freezing cold of the mountains and the typical humid heat of the Andean jungle. Arriving to Machu Picchu implies a 5-day experience. But it is a wonderful trip that will definitely be worth it! Along this road you will have to trek on high trails that exceed 3,000 (1) msnm and then descend and traverse low areas with heights of approximately 1,500 meters above sea level. This is a classic adventure tour that you cannot miss. If you have already decided to embark in this incredible adventure, discover here the places that you will be visiting during each day of this wonderful tour to this famous Inca sanctuary in Peru. What you need to pack? The great adventure towards Machu Picchu begins in Cusco. This first day you will depart to the town of Mollepata, located about two and a half hours by car. The final destination of this first hike is the Soraypampa camp: there you must travel 12 km and reach an altitude of 3,920 meters. This first walk allows you to marvel at the natural landscape of the place. 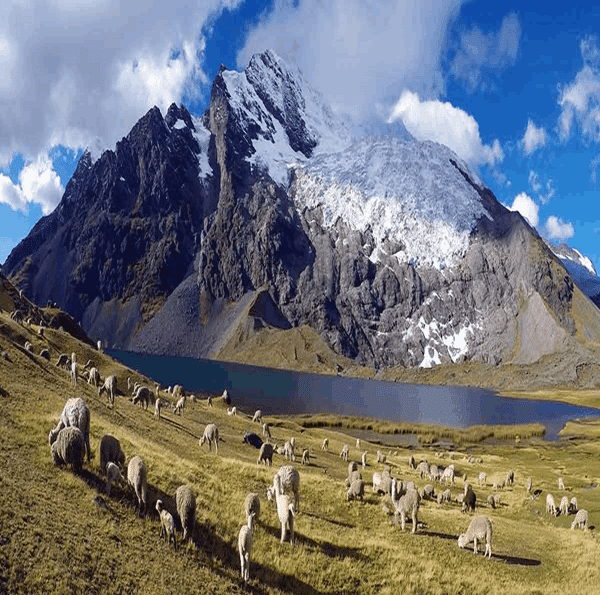 You will see the incredible Nevado del Salkantay among the distant mountains, while you approach the route you will also be able to observe the cultivation areas of the local people. The best thing about this trip is that it is almost flat, there are no steep slopes, so it will be like a warm-up for the crossing. After about three hours of walking, you will get to Soraypampa where you can continue climbing another hour until you reach Lake Humantay. This is one of the natural wonders that you will have the privilege of knowing and that you will surely love from the first moment you get there. It is a lake with turquoise waters surrounded by imposing glaciers that reflect in the water. If you dare, you can even bathe in its crystal clear waters, but you should keep in mind that they are very cold so it’s only for the brave. In any case, being in this place will make you feel as if someone had taken you to a magical fairy tale. There are no words to describe the energy that you will feel along this way. At this point, you will be more than excited to continue the adventure of discovering the natural beauty of these mountains. After resting in Soraypampa, your trip will continue to the next point. The distance to travel is approximately 22 km and the objective is to get to Chaullay, but before you may go through other very interesting places as well. On this second day, the area will be a bit more difficult because it is uphill. But there is nothing to worry about. The trip is very enjoyable due to the company of your group. In addition, you will be surrounded by the magnificence of the mountains, breathing pure air and filling with energy, which makes it an experience of another level. From the start of the journey to the first rest stop, Salkantay Pampa, you walk for about an hour. Then you must continue the journey until you reach Soirococha. At this point, it will be at 4,400 meters, one of the highest it will reach. The next one will be Salkantay Pass, the highest point of the whole route: 4.630 (1) meters. Can you imagine being there on the mountaintop? Throughout this journey, you can enjoy a spectacular landscape. One of the most interesting things you will see is the crystallization of ice in the stones of rivers that flow from the mountains, as well as many plants covered by the ice. The road continues until you pass Wayra Punku until finally reaching Chaullay where this second day of the tour ends. Once you have passed Salkantay Pass, the trekking becomes a bit lighter because you will begin to descend. In fact, in Chaullay you will be at 2,900 meters high. The third day of this tour begins with an incredible energy attributed to the fog descending on the mountains. In this area, there is also a hut made of stones which are located at the base of a huge rock that offers an amazing view. It is, without a doubt, a dream landscape that you will never find in any other place. From Chaullay to Lucmabamba the road goes down and once there you will continue to find more and more surprises. Do you like flowers? While trekking you won’t take your eyes off the road because one of the elements that stands out is the flora. The narrow paths are surrounded by numerous leafy plants and wildflowers such as different the types of orchids. From this point on, the climate changes. You will no longer feel the breeze of the mountains, but the warmth of the forest. On the walk through the exuberant jungle, you will find wild fruits such as banana, avocado and passion fruit. You will also enjoy incredible waterfalls and streams where you can cool off for a while. You will arrive at a small town called La Playa and then, to Lucmabamba where you will rest to recover some energy for the next day. Now closer to Machu Picchu! In the fourth day, the tour fills up with the emotion to arrive at the famous Inca town. The first key point of this trek is Llactapata, which is a legendary Inca archaeological site. In this place, you will feel much closer to Machu Picchu because from this point you can see the entire Valley that surrounds it. In the past, Llactapata was used by the Incas as a temple and a resting place. Then a descending path will take you to the Hydroelectric Plant, which is 1,890 meters high and then go to Aguas Calientes. This route is not difficult to trek, since the section is flat and there are no slopes. This means that you can go a little more relaxed, enjoying the scenery without having to make much effort. The route starts along the train rails and the journey lasts between two and three hours. This path is also surrounded by lots of flora and fauna, so you can continue to appreciate the many wonders of nature. Aguas Calientes is known as “Machu Picchu town” due to its proximity to Machu Picchu. In fact, in some parts of the way you can see part of the wonderful buildings of the famous Inca citadel at the top of the cliffs. 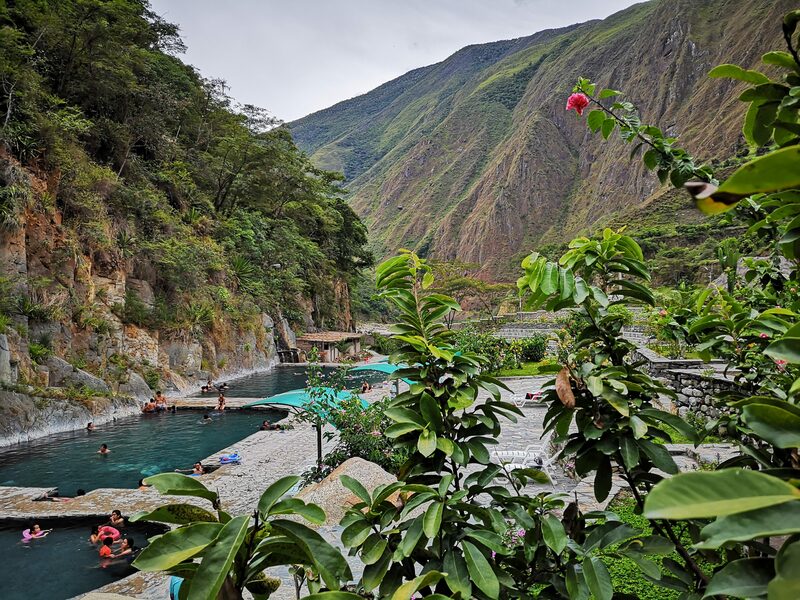 Once in Aguas Calientes, you can relax in the hot springs, an amazing place to relax the muscles that have been active during the four days of walking. This day you will enjoy a restful night in a hotel with all the comforts. Thus, with the bath in the thermal waters and the comfortable night rest, you will be completely ready for the most important day of the tour. Day 5No more trekking, let the adventure begin... Welcome to Machu Picchu! The most expected day has arrived. Finally, you will know the magical land of Machu Picchu, a masterpiece of engineering and architecture. Your emotion, as well as your energy, will increase as you go through the forest. It will be a bit different route to the previous ones, in which you will find a path with the steps that separate you from your expected destination. It is likely that the desire to get to Machu Picchu will motivate you to go faster. But do not worry, you’ll have plenty of time to explore this world wonder. Its magnificence will leave you breathless and you can not believe how the Incas were so skilled to build, without modern tools, a city so perfectly balanced. This may be a mystery that humanity will never solve, but the most important thing is that today you can enjoy a natural beauty like no other. Are you ready to experience one of the greatest adventures of your life? Knowing Machu Picchu is a unique experience you will never forget. This is for sure one of those dream destinations that you must visit at least once in a lifetime. So, why not do it now? It is something you will definitely never regret.